We recommend checking out our discussion threads on the Ikelite 6842.65 SLR-DC Underwater Housing for Sony A57 / 6842.65, which address similar problems with connecting and setting up Still Cameras & Housings Ikelite. The user manual for the Ikelite 6842.65 SLR-DC Underwater Housing for Sony A57 / 6842.65 provides necessary instructions for the proper use of the product Photography - Underwater Photography - Still Cameras & Housings. 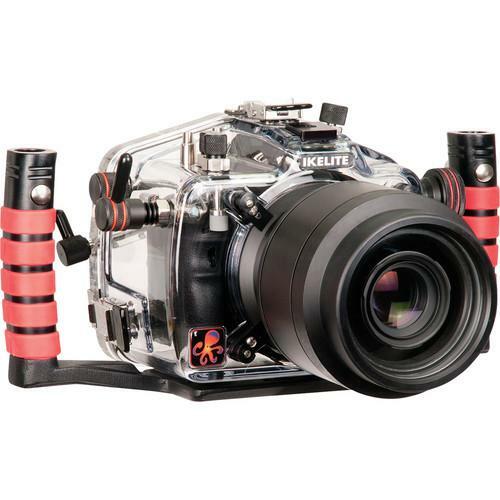 The Ikelite 6842.65 SLR-DC Underwater Housing for Sony A57 / A65 SLT Camera is a clear polycarbonate case that allows you to shoot underwater with your Sony Alpha A57 or A65 SLT Camera. Durable, corrosion-resistant and contoured to the camera, the housing features a depth rating of 200' (60 m). Its buoyancy is only slightly negative in salt water, depending on your choice of lens port (required but sold separately). A clear view of the main o-ring seal, port o-ring seal and camera function controls offers ease of use and confidence. The housing allows full access to all camera controls except for the diopter adjustment dial, preview button and flash pop-up button. The mechanical controls are kept water-tight with Ikelite pioneered Quad-Ring seal glands. The large zoom control knob is comfortably reached without taking your hand off the handle. Recording start / stop while in video mode is effortlessly accessible via your right thumb. The Super-Eye magnifier comes standard and provides better visibility of the camera's viewfinder while wearing a diving mask. The camera's large LCD screen is clearly visible through the rear of the housing. The live preview feature of the camera is accessible for framing your photos using the LCD. Release handles with comfortable rubber grips allow for simple attachment and removal of mounting arms at the touch of a button. Two 12-24 screws remove the handle and tray assembly for easy transport. A 1/4-20 threaded top mount enables attachment of a focus light. The housing accepts the optional #9571.6 1.0" (2.5 cm) or #9573.1 Flex Ball Adapters, sold separately. A complete range of dome and flat ports accommodate the majority of macro, wide angle and zoom lenses. The standard port line provides compact and affordable options without sacrificing quality. The modular port system delivers maximum versatility and performance with interchangeable 8.0" dome and flat port assemblies. Port attachment is fast and easy with a simple locking system, and the port o-ring seal is clearly visible through the housing. The housing supports TTL exposure with all current model (as of Nov 2011) Ikelite DS substrobes (not included), via built-in conversion circuitry. Hard-wired TTL control provides more correct exposure, quicker recycle times and longer battery life for your camera and strobe. Exposure is adjustable directly through the back of the housing via 2 push buttons. Settings are clearly indicated even in the dark, thanks to a series of LED lights. The TTL mode offers 4 half f/stop increments over or under flash compensation for fine-tuning exposure. Eight manual power settings in half-stop increments enable total creative control. Use the #4103.52 dual sync cord to connect 2 DS Substrobes to your system. Non-Ikelite strobes may be used, but cannot offer eTTL exposure or be manually adjusted through the housing. The optional #9571.3 features a 1.0" (2.5 cm) ball for attachment to the top of the release handle. This gives you a mounting point for Ultralight, TLC and other non-Ikelite arm systems. Several options are available to add a video light to your housing, thus enhancing your underwater photography: The DS161 Movie Substrobe, Pro-V8 LED Light, Pro Video Lite 3 and PRO-2800 LED Video System (coming soon). If you own a Ikelite still cameras & housings and have a user manual in electronic form, you can upload it to this website using the link on the right side of the screen. Box Dimensions (LxWxH) 14.2 x 9.8 x 9.5"
The user manual for the Ikelite 6842.65 SLR-DC Underwater Housing for Sony A57 / 6842.65 can be downloaded in .pdf format if it did not come with your new still cameras & housings, although the seller is required to supply one. It is also quite common that customers throw out the user manual with the box, or put the CD away somewhere and then can’t find it. That’s why we and other Ikelite users keep a unique electronic library for Ikelite still cameras & housingss, where you can use our link to download the user manual for the Ikelite 6842.65 SLR-DC Underwater Housing for Sony A57 / 6842.65. The user manual lists all of the functions of the Ikelite 6842.65 SLR-DC Underwater Housing for Sony A57 / 6842.65, all the basic and advanced features and tells you how to use the still cameras & housings. The manual also provides troubleshooting for common problems. Even greater detail is provided by the service manual, which is not typically shipped with the product, but which can often be downloaded from Ikelite service. If you want to help expand our database, you can upload a link to this website to download a user manual or service manual, ideally in .pdf format. These pages are created by you – users of the Ikelite 6842.65 SLR-DC Underwater Housing for Sony A57 / 6842.65. User manuals are also available on the Ikelite website under Photography - Underwater Photography - Still Cameras & Housings.